Fried rice is one of my go-to dinner ideas when I really have no energy to cook but want something satisfying and healthy. Someone once asked me after a cooking class, "So what will you be making for dinner tonight?" and since I had just done a three hour cooking class, I knew my answer would be something simple, so I told her I was planning to make fried rice. Her response was something along the lines of thinking it sounded too complicated and needed too many ingredients, which might be the case for others too. So I am here to tell you that yes!, you can make fried rice easily, in about 15 minutes, with few ingredients and a few tricks to speed up the process. First, I highly recommend heading over to your nearest grocery store and grabbing some frozen pre-cooked rice. I personally love the frozen brown rice from Trader Joes, but Whole Foods also makes a good frozen rice and so do many other brands that you will find in the freezer aisle. Just make sure to check the labels so you know that all you're getting is pure brown rice - make sure not to grab anything with a sauce in it. When you get home, nuke one of the bags (or measure out 2 cups), and cook it, then store it in an airtight container to use later. 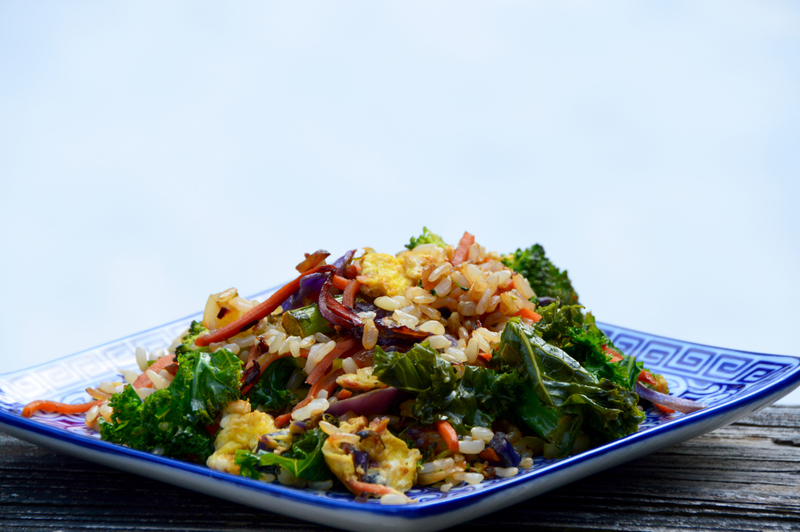 To achieve perfect fried rice every time, it's always recommended to use cooked cold rice. That's what gives the rice a little crispiness rather than soggy or mushy rice. You can make the rice one to two days ahead of time and keep it in the fridge. 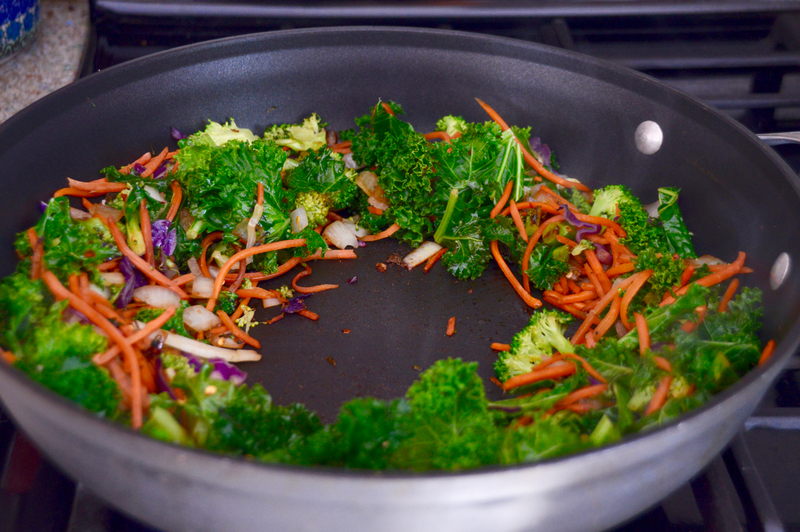 When you are ready to make the fried rice, grab all of your vegetables: perhaps some pre-shredded carrots, frozen peas (which go in right at the end), a bag of broccoli florets, some pre-shredded kale or cabbage, sliced mushrooms, peppers, onions or whatever else you enjoy. You can even buy onion pre-chopped too if you feel so inclined. This way, you are spending less time prepping your ingredients for the dish. If you enjoy slicing and dicing, then go ahead and prep your veggies when you get home from the store so they are ready to use for when you make this dish. Store in airtight containers so they last through the week. Next, take two eggs and lightly beat them in a small bowl - you're going to make scrambled eggs right in the middle of the pan! The only other ingredients you need are soy sauce, sesame oil, and red pepper flakes. If you don't like spice, just omit the red pepper flakes. Another yummy tip: do you like to put duck sauce or sweet chili sauce on everything you order from the Chinese restaurant? Go ahead and garnish your fried rice with one of these sauces as well for an extra kick of flavor! 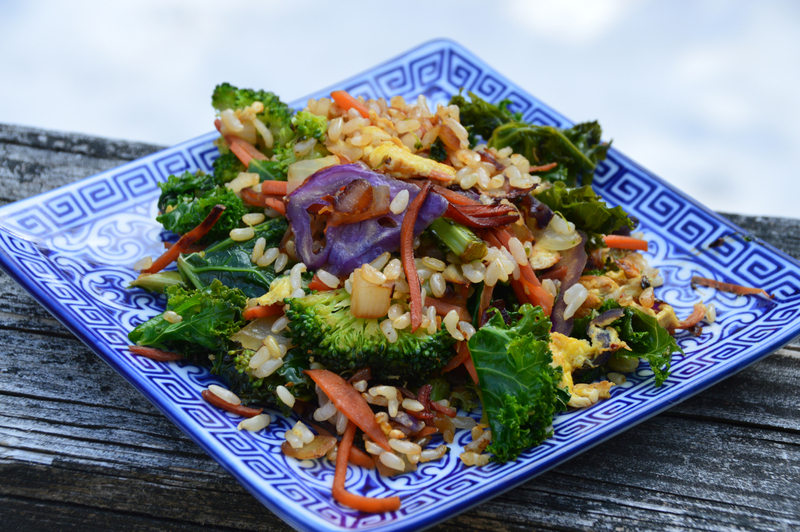 This recipe is specifically for vegetable fried rice, however you can also grab some ground chicken, pork or turkey to mix in to this as well. Ryan and I like to have ours with the Sweet Chili Vegetable Burgers from Trader Joes on top, but any of those other proteins work as well. Once you have all your ingredients laid out, the next thing to do is cook! If you're adding ground meat to this, cook the meat first, then push the cooked meat to the sides of the pan and put the veggies in the middle. Cover to let the veggies steam - leave the frozen green peas for the end - stirring occasionally to prevent sticking, then after about 5 minutes, pour the soy sauce and sesame oil in, then sprinkle the red pepper flakes in. Stir to combine everything. Now take your meat and veggie mixture and push it all to the sides of the pan to create an opening in the middle. 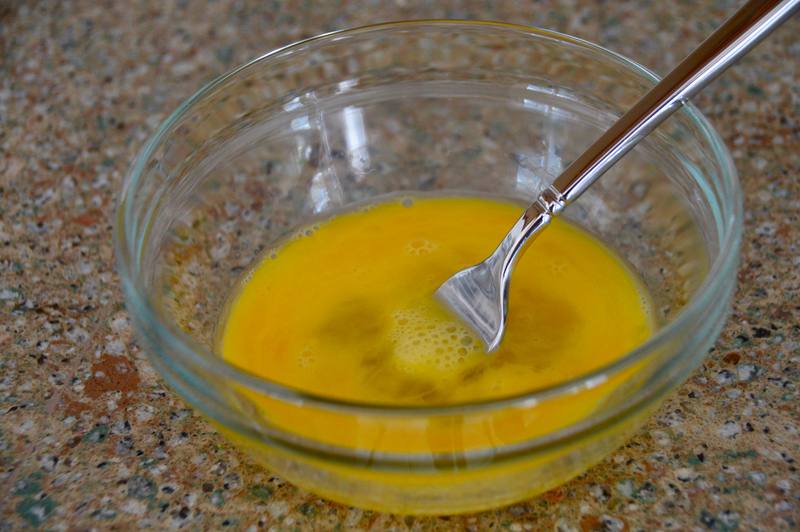 Pour the egg in and lightly stir the egg until it forms into a scrambled egg. A ½ C of an assortment of vegetables - try pre shredded carrots, frozen peas, sliced mushrooms, chopped onion, broccoli florets, chopped lacinato kale, shredded cabbage and chopped bell pepper. Cook the rice a day or two ahead or cook rice now and spread out on a baking sheet and place in the freezer for 20 minutes to cool. If you're adding in ground meat to this, cook the meat first, then push the cooked meat to the sides of the pan and put the veggies in the middle. Cover to let the veggies steam, stirring occasionally to prevent sticking, then after about 5 minutes, pour the soy sauce and sesame oil in, then sprinkle the red pepper flakes in. Stir to combine everything. Now take your meat and veggie mixture and push it all to the sides of the pan to create an opening in the middle. Pour the egg in and lightly stir the egg until it forms into a scrambled egg. 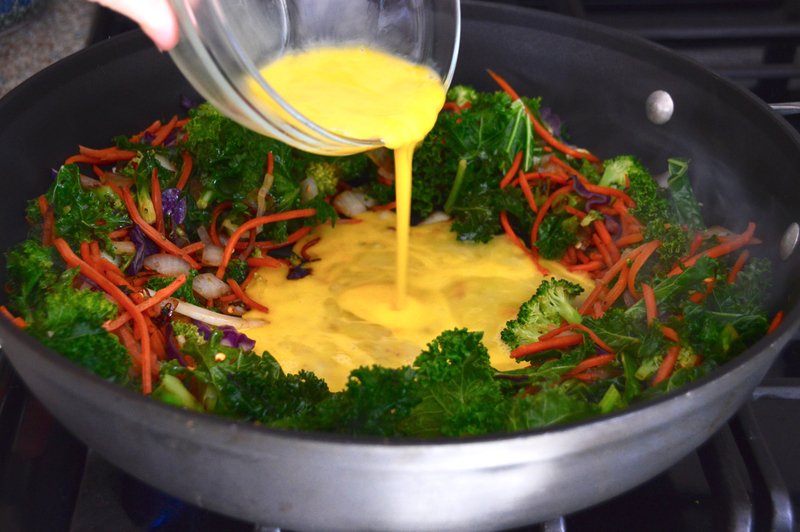 Once the egg is scrambled, mix everything together then voila! Delicious fried rice in 15 minutes and a dinner everyone will scream about 🙂 Season with either one more tablespoon of soy sauce or a touch of salt if more flavor is needed.